Professor Nitish V. Thakor assumed duty as Provost’s Chair Professor in the Department of Electrical and Computer Engineering on 27 March 2012 with joint appointment to the Department of Bioengineering and the Department of Medicine. Professor Thakor has also been appointed Director of the University level neuroengineering research centre SiNAPSE (Singapore Institute for Neurotechnology : Advancing through Partnership of Scientists and Engineers). 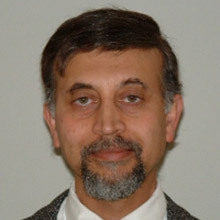 Professor Thakor has been a Full Professor of Biomedical Engineering at the Johns Hopkins University since 1994. He has authored 230 peer-reviewed publications in the areas of neurological instrumentation, biomedical signal processing, micro and nanotechnologies, neural prosthesis, and clinical applications of neural and rehabilitation technologies. He has also generated 11 patents and co-founded 4 companies. His research has been funded mainly by the NIH, NSF and DARPA. He is Editor in Chief of the IEEE Transactions on Neural and Rehabilitation Engineering. Professor Thakor is a recipient of a Research Career Development Award from the National Institutes of Health and a Presidential Young Investigator Award from the National Science Foundation. He is a Fellow of the American Institute of Medical and Biological Engineering, a Fellow of the Institute of Electrical and Electronics Engineers and a Founding Fellow of the Biomedical Engineering Society. He is also a recipient of the Centennial Medal from the University of Wisconsin School of Engineering, an Honorary Membership from Alpha Eta Mu Beta Biomedical Engineering Student Honor Society and a Distinguished Service Award from IIT Bombay.